There are a lot of problems when it comes to talking about mental health in America. One of those problems is that it is not often a mainstream discussion; we address suicide during awareness weeks or awareness months, or after a high profile and well publicized death, but generally day-to-day? Not so much. For precisely those reasons, I was extremely grateful to have been able to be a guest on Christopher Lochhead’s podcast, Follow Your Different. 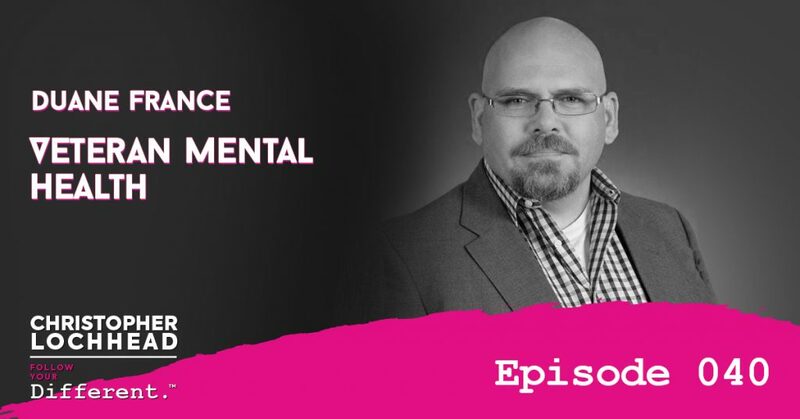 We had him on episode 100 of the Head Space and Timing podcast, which was great to bring his insights to a wider audience of service members, veterans, and their families. It was even better, for me, to be on his show, highlighting the importance of veteran mental health to his audience. His show has been listed as one of the 1oo Outstanding Podcasts for 2019, is a #1 Bestselling author (twice) and an amazingly interesting person. Check out my conversation with Christopher to learn more about veteran mental health, common stereotypes, veteran entrepreneurship, and how his dentist lets him choose between tequila and scotch before he sits in the chair.